Getting married is one of the most incredible things you will do in your life. Putting how you feel on your day into words is difficult, but it can be achieved with pictures. Which is where I come in; capturing the emotion, the journey, your story. Wedding photography really is an investment for life, and future generations. I feel it is so important to capture, and preserve forever. You write the script. My focus is then upon documenting your story beautifully, through observation, not orchestration, with attention paid to every detail. I believe a wedding should be photographed sympathetically and subtly. A quiet observer, blending into the background, telling the Story, from start to finish. And when I say the finish, that means capturing every element of your day, right till the end, if you wish. Predominantly, my style of work is documentary. I tell a story, through photographs. This is often referred to as reportage photography, wedding photo-journalism, candid, fly-on-the-wall, call it what you will, in essence they are all very much one and the same. The key essence for me that defines my style is telling the story. As a documentary photographer, I don’t want to influence the day, you have planned it down to the minute detail, and I am pretty sure that asking the photographer what they would like to do is never part of the wedding plan. So I start each wedding with a blank canvas, and the objective of capturing the humanity and flow of the day. It is a more skilled approach, for there is no script to follow, no guarantee of the pre-visualised photograph, and the pressure to capture the story and not miss a thing, and this is the challenge that I love which makes every wedding as fresh as the first. And for me, that drive and excitement is essential if you are going to tell the story at its best. I could simply ask a bride to look at me and smile naturally, but I know very few brides who would do this comfortably. I have to wait and anticipate, and actively seek the moments, gently encourage the moments, knowing from experience what is likely to happen and when. One of the clear advantages of the documentary style is the capture of emotion, no posed photograph will ever capture this. And of course, as those in the photograph were focused on the moment, not the photographer, they will have very little recollection of the photograph being taken, if at all. Therefore when they see the finished image for the first time, it can be extremely powerful. For me, these are some of my most sought after images. They can never be planned, none of my true documentary photographs ever are, and yet they have more impact than any image that might be on the list. It’s the moments you don’t remember which are often the most powerful. 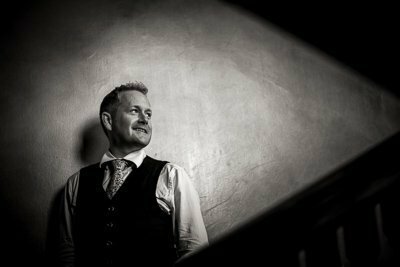 I am award winning professional photographer, with 15 years experience in the industry, holding Associateships of both the Society of Wedding and Portrait Photographers and also the Royal Photographic Society, awards held by only the top 10% of photographers in the UK. HOW DO YOU COPE WITH THE WEATHER? As much as possible, I record the weather as any other aspect of the wedding day, as that is all part of the atmosphere of your day. Don’t worry, bad weather doesn’t neccesarily mean bad photographs; often reflected light from wet ground creates even better lighting than on a sunny day, and guests are much less likely to squint! I use up to the minute forecasts and live weather data on the day to spot any windows in the weather which can be used. Whatever the weather, you and your guests will make it the day that it is! I also bring matching black and white umbrellas for you to use to keep you dry if the worst happens! There are no limitations, within reason! Many of my clients chose me because of my unique style and reputation, therefore I am more than happy to travel to work with the right clients, rather than just covering all weddings in a local area. I have covered weddings as far apart as Scotland and Cornwall! Due to the time involved in order to deliver exceptional quality, I only cover a set amount of weddings each year; therefore it’s first come first served! DO YOU REALLY COVER THE WHOLE DAY? Absolutely – I can cover every aspect of your wedding up until the last person falls on the dancefloor if required, or if you are having some magical fireworks, or something else special. My job is to document your day from start to finish, and I certainly won’t leave if you want me to stay a little longer. I am also happy to start early in the morning and cover preparations, or the complete memories of your day – that is what documentary photography is all about.